I thought you might be interested in seeing some of the specialist software that helps me to write my cryptic crosswords. The latest tool in my arsenal is Wordplay Wizard, the creation of "Crossword Man", British-born Ross Beresford. He has several other programs for writing crosswords, but as I have custom crossword software written by my husband, all I need is this little one. This is PC only software, so I especially got Parallels Desktop 7 and Windows 7 for my Mac, and Wordplay Wizard runs beautifully in a separate window on my Mac desktop. So, what does Wordplay Wizard do? Well, it is rather awesome (I get excited by it, anyway!) ... you type in a word, any word (in fact, any collection of letters), and it will bring up all the possible arrangements and ways of clueing that word with a cryptic device! When you have to write as many cryptic crosswords as I do at the moment (1-2 full crosswords per day, which is about 30-70 clues! ), you can see that this is an absolutely invaluable help — better than me sitting staring at each word from the crossword, to come up with the best way to break it up. 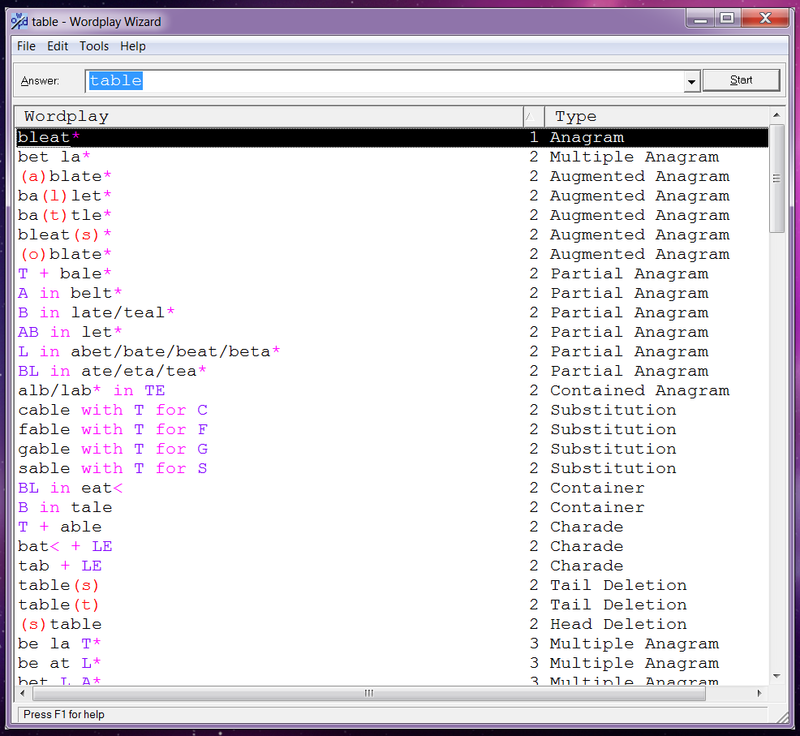 In the screen shot below, I've entered the word TABLE in, and you can see that TABLE is a complete anagram of BLEAT. It can also be clued as an anagram of BET + LA. 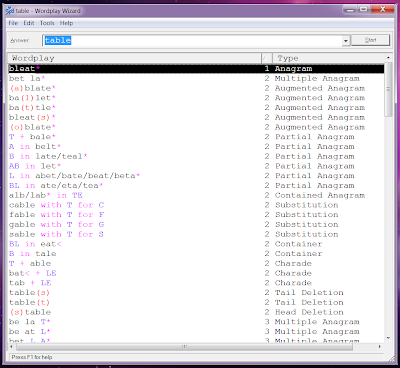 Or you can get TABLE from ABLATE, with the A removed, and the rest of the letters scrambled up. Or T plus ABLE. Or TABLET with the final letter deleted. Or as FABLE with the F replaced with a T. Or ... a LOT of other ways! The numbers in the column indicate how many 'letter fragment parts' there are in that particular wordplay (fewer is usually better). The < mark indicates that a word is reversed within the cryptic clue wordplay, and the * indicates an anagram. All the single letters and letter pairs in purple indicate abbreviations. If I click on one, a list of all standard abbreviations used for that letter pops up, which helps enormously when writing the clues. Also, they are categorised by whether the abbreviations are standard in all cryptics, just in UK ones, or only found in UK Advanced cryptics. Clicking on the pink 'indicator' symbols also brings up lists of words used to indicate those devices. I love that the anagram indicators can be sorted by word type (adjective, noun, verb, phrase etc). Oh that is so clever and ever so helpful to you!! Many thanks for the write-up. I'm so glad you find the software helpful in creating cryptic clues. I'm now an American citizen, by the way, but Wordplay Wizard is definitely the product of the Brit in me! This is a similar game can be played using sentences. I just wish my kids will be able to play this later on when they grow up. Thanks for this.